It’s huge and intimidating, yet docile and gentle. It’s the world’s biggest fish and holds many other records in the animal kingdom for its sheer size. The shark often inspires terror among so many for the predatory reputation of its various species but the whale shark feeds mostly on plankton and poses no significant danger to people. Experiencing this phenomenon in the wild is therefore something to really look forward to. At the waters off Oslob in southern Cebu, Philippines, we finally encountered this remarkable animal in person. Tan-awan is a sleepy seaside barangay of Oslob town and the whale sharks have always been here as far back as townsfolk could remember. They are migratory animals and would come to feed on plankton that are present in great numbers at certain times of the year. Initially they were considered pests by the fishermen as these giants would gobble up the krill that fishermen were using as bait to catch other fish. Eventually though some fishermen started protecting these gentle giants, even feeding them, believing that doing so would bring them good fortune. Soon some dive shops in nearby areas took notice and began paying the fishermen to take divers to the whale sharks. The rest was history as news of these whale shark interactions began to spread. This kind of whale shark interaction is not without controversy, however. Scientists and conservationists believe that feeding the whale sharks will alter the animal’s migratory behavior (subsequently affecting their breeding patterns) and create a dangerous dependence on people. They are suggesting other means of making this kind of tourism more sustainable, such as what has been done at Donsol in Sorsogon. 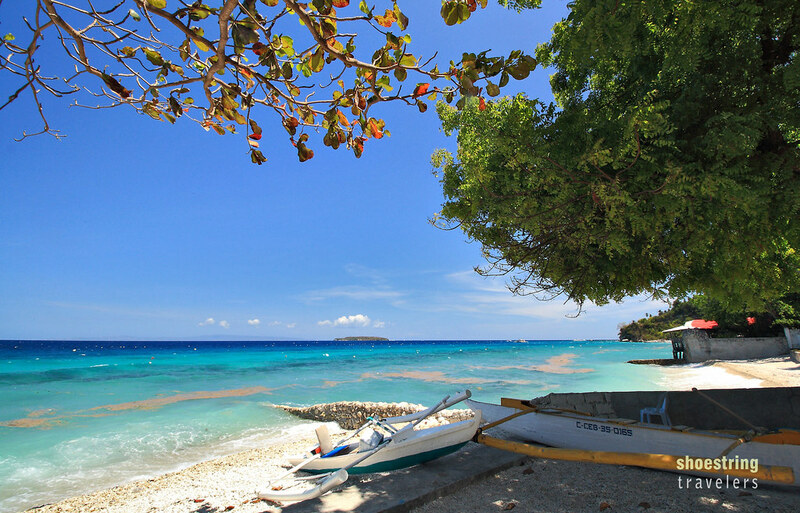 It’s a thorny issue since we also know that Oslob’s population, especially the fishermen, have seen their lives changed overnight as a result of the tourism boom that followed. Interestingly the folks at Oslob are nice and gentle, much like the whale sharks they are now hosting, and solutions to this issue will have to take their welfare into consideration as well. The boat we rode in meeting the whale sharks was hand-paddled (without engines), just like any other boat used in these tours. This was supposed to protect the whale sharks from accidentally getting injured by boat propellers. The rules for the whale shark interaction are pretty strict, ostensibly to protect the whale sharks. Enforcement is another matter however, as some tourists become so excited as to approach a whale shark to less than the maximum distance allowed – 4 meters in this case. In the water we were careful to steer clear off the whale shark’s giant tailfin lest we get accidentally sideswiped but these giants moved slowly while feeding, while some remained in an almost vertical position. One can actually just view them from the boat as some of our companions did; the waters here are so clear it is easy to see the whale sharks underwater. But snorkeling and diving gives you a more awe-inspiring view and greater appreciation of their tremendous size. A Korean lady on the boat next to us was in the water when she noticed one of the whale sharks headed straight towards her. Screaming in fright she immediately swerved away from the big fish’s path. We laughed while observing this knowing that whale sharks are gentle and pose no threat to humans but it was hard to fault the lady when a 2-ton animal, gentle or not, was headed her way. Whale shark viewed underwater. Photo courtesy of Wikipedia Commons. Interestingly the white stripes and spots on the gray backs of the whale sharks are unique to each individual, much like human fingerprints. So much so that the fishermen here have given some of them names as they are able to identify individual sharks through these spot patterns. We also noticed that one, two or sometimes three fish would be swimming with and sticking to the whale sharks wherever they went. These are remoras – fish that feed on material dropped by the sharks, and sometimes on parasites on the shark’s skin in a kind of symbiotic relationship that benefits the whale sharks as well. Another bonus was the huge number of blue and yellow fusiliers and sweetlips that also followed the sharks and fed on krill that the whale sharks miss. Unfortunately we did not get an underwater camera to record the interesting scenes. After the whale sharks have gone: a coastal scene in Tan-awan, Oslob. All these drama underwater was over in less than 45 minutes. We were fortunate since on weekends the interaction time is limited to 30 minutes to allow for the greater number of visitors. For lunch we headed off to Sumilon Island and its beautiful sandbar, took a siesta there and then returned afterwards to Tan-awan Oslob. A talisay or tropical almond tree provides a bit of a shade at an Oslob beachfront. It was on our return to Oslob’s beachfront that we noticed the beauty of this town’s shores. We took the time to rest here before catching a ride back to Liloan port for the return trip to Dumaguete. We realized that all the excitement of the whale shark watching tour had somehow masked the beautiful white sand beaches and turquoise waters of this and other towns in southern Cebu. For directions on how to get to Oslob go to this page. Posted in CebuTagged beach, Cebu, central visayas, nature, Oslob, outdoors, philippines, Tan-awan, travel, watching, whale sharkBookmark the permalink. Reblogged this on The Pinoy JUANderer.